Expansion Inserts are made from Free Machining, Free Cutting, Leaded Brass, 300 Series Stainless Steel or Aluminium which are Passivated and Tested to ASTM Standard. Expansion Inserts are available in any metric or imperial sizes as per custom specification. Expansion Inserts are Highly Versatile and Standard Inserts. Expanded Inserts are pressed into the plastic and expand when the assembly screw is tightened. The Mating Screws of Expansion Inserts should be designed for full thread engagement which allow the insert to fully expand. Expansion Inserts ae also available with Flange which adds greater strength for tensile pull loads. Standard Expansion Inserts can also be installed to protrude, serving a dual purpose as an assembly-locating device. The sharp diamond knurling provides resistance to tensile and torque loads. Expansion Inserts provide Easy Installation. No Torque and Pull-Out Resistance. Expansion Inserts increase friction enhancing interference between the insert and the hole. Expansion Inserts meet RoHS Requirement and UL Listed. Expansion Inserts used widely to provide strong brass threads in plastic parts of all types after molding. 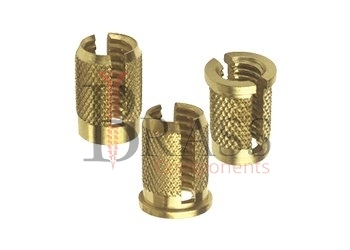 General Range of Expansion Inserts used for application where long-life threads are required. Designed to provide strong reusable threads in thermoset and other hard plastics. Used where a durable thread is required. Standard Expansion Inserts ideally suited for use in plastics which are strong enough to resist the expansion of the insert yet flexible enough to allow the knurls to anchor into the material. Mainly used in plastics and rely on the radial pressure exerted by the screw to lock the insert into position. We manufacture Expansion Inserts as per Custom Specification and export in Germany, Spain, Netherlands, Portugal, UK and other European Countries. For more Information, Please Contact Us or Inquiry Now.